In June 1812, the United States declared war on Great Britain. The War of 1812 was the culmination of a decade of friction between the two countries over trade, Indian relations and the long border between British Canada and America. 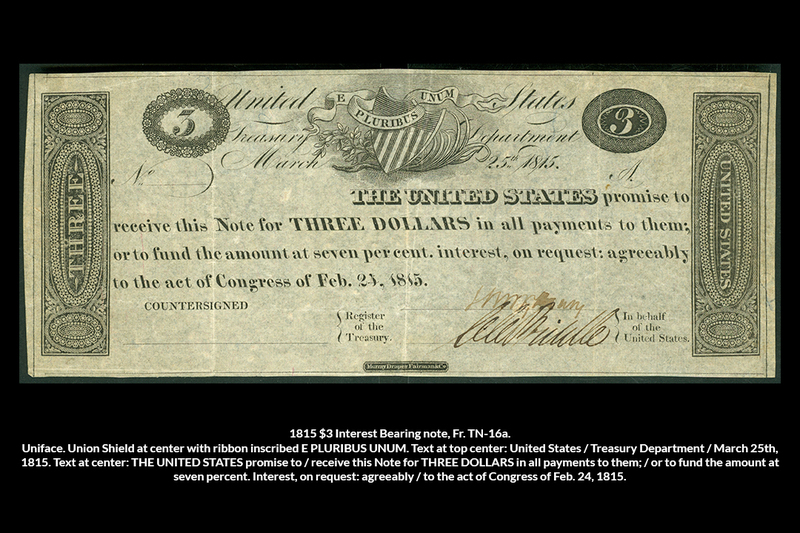 The conflict exacerbated existing economic hardship, and the U.S. was forced to issue circulating Treasury notes to finance the war—the first federal paper currency produced since the Continental Currency of the American Revolution. The ANA Money Museum is fortunate to have three of these rarities in its collection: $3, $10 and $50 bills, all dated 1815. In the years before the war as conflict became increasingly likely, the government looked for ways to generate revenue for the effort. 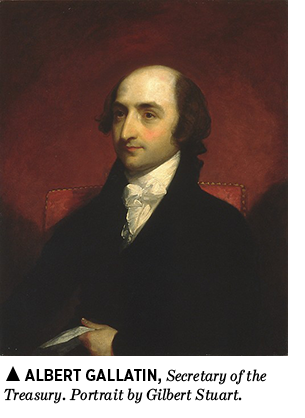 Secretary of the Treasury Albert Gallatin originally proposed Treasury notes in 1810. Lacking a national bank or income tax, the government relied on direct loans to finance the first stages of the conflict until Congress enacted Gallatin’s idea and authorized the new interest-bearing Treasury notes on June 30, 1812. The first issue was in denominations of $100 and $1,000 with an interest rate of 5.4 percent, or 1.5 cents per day per $100. These notes were an instant success and quickly sold out. Four more issues were made in February 1813, March and December 1814, and February 1815. All issues were printed in Philadelphia by Murray, Draper, Fairman & Co. 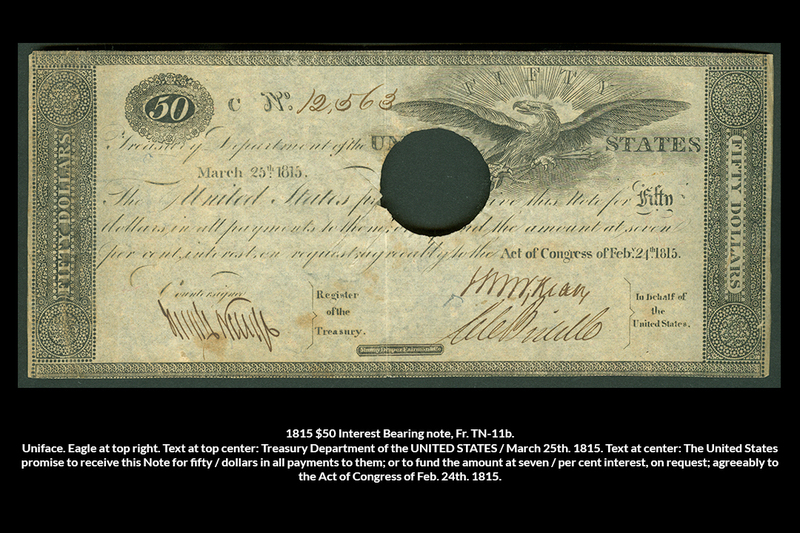 It was the fifth issue that represented the first true circulating federal paper currency with the creation of non-interest-bearing Treasury notes in small denominations of $3, $5, $10, $20 and $50. 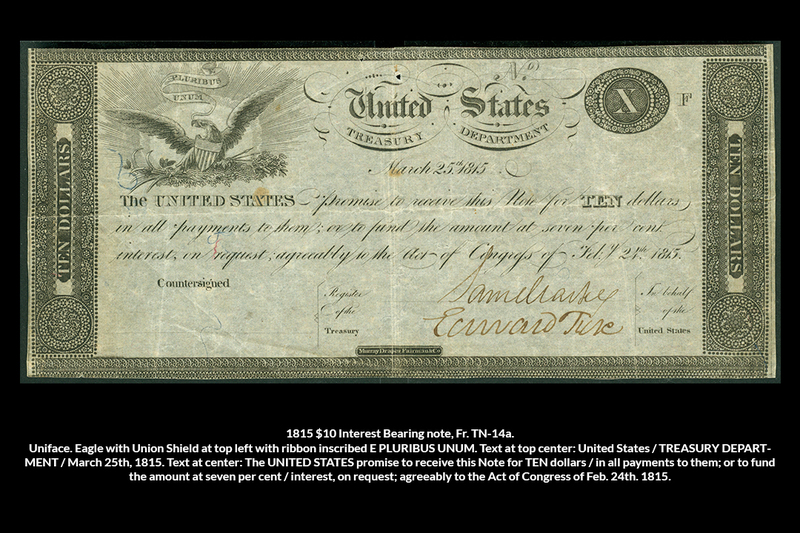 A total of more than $36 million worth of notes, denominated from $3 to $1,000, were issued during and after the war. The larger notes were convertible into gold and silver and accrued interest, and were popular among banks as a form of reserve. Since customs duty transactions normally could be accomplished only with gold or silver coinage, the notes facilitated commerce and eased the money shortage. The lower denominations of the fifth issue met the critical need for smaller exchanges. Although not interest-bearing, these notes could, along with the larger denominations, be used to purchase 7-percent interest bonds. The popularity of the War of 1812 Treasury notes with banks for use as monetary reserves ensured that they retained their value, thus making them the first successful circulating paper currency of the United States and setting the stage for the extensive issues of the Civil War. The notes were discontinued in March 1817 when Congress repealed the Treasury note acts and prohibited their further release. Most were returned to the Treasury and destroyed, thus making them quite rare today. In fact, most surviving examples are unissued, unsigned remainders. Comprehensive Catalog of U.S. Paper Money, All United States Federal Currency Since 1812, by Gene Hessler. Very informative... interesting point regarding how they informed the eventual issuance of paper money during the Civil War. Thank you for a well researched and interesting blog! Your photos of the currency are great! I'm getting into the Civil War Era notes, it's great fun and there's so much to learn! Like our USA currency. Great point Mike!! Some currency is mad from linen and other materials beside paper.. I have been collection currency for about a year now as well as keeping up my coins. They are great to collect. So many different kinds. Going back to to the War for Independence in the 1770's. I am concentrating on CSA currency right now. It's an important part of our history and most notes are beautiful in their vignette art. Thanks. I love tales from t he vault. Thanks. Currency is much harder to save as it is paper, and the fact that someone saved these and protected them all this time is refreshing. A wonderful bit of history along with them as well. I enjoyed this blog so much. I'm still learning abt currency & there is much to learn. Thanks for an informative & well researched blog.